Smith Mountain Lake.The Tahoe Of The East. Just found your site (I guess thats what you call it) really enjoy all the reading. 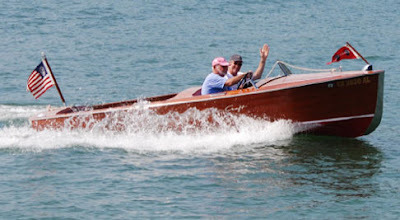 I have been a member of the Smith Mountain Antique Boat Club for several years now and have attended the past 6 shows. I can say that each year it gets a little better. This year the show has been moved back about 3 weeks so I think the tourist crowd will be down some (not that it was ever crowded) but now the weather should also be a little cooler hopefully. I have shown my ’64 ChrisCraft Supersport and sold it 2 years ago at this show. As last year I will be bringing my restored ’78 Mercury Powered Tunnel Hull Hydro (Hot Stuff) and also again will be setting up my vendor display of boating nostalgia and collectibles.This is a great show and really worth attending if you can. I hope the Jersey Skiffs can come back this year, two years ago I had the unbelievable experience of riding in “Hot Tub”, that was the wildest boat ride I have ever had. If you ever get the chance to be a passenger in one of these, it will be a ride you will remember! GReat comment, we will be doing live postings on this site while there.